Tensioned fabric structures are unique forms of tensile membrane construction that vary greatly in their applications, sizes, and designs. 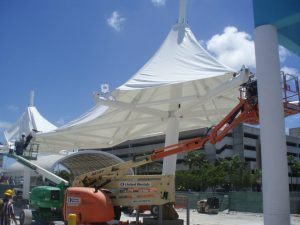 From functional rooftops over amphitheaters to beautiful walkway and entry designs in retail spaces and transit facilities, tensioned fabric structures provide customized solutions for shade, weather protection, aesthetics, and many other challenges. Similar to traditional construction projects, these permanent or semi-permanent structures require specialized expertise for safe and efficient installation. As a design-build specialty contractor, the team at Tension Structures (a Division of Eide Industries, Inc.) uses a multi-stage process to ensure your tensile membrane construction project exceeds your expectations. 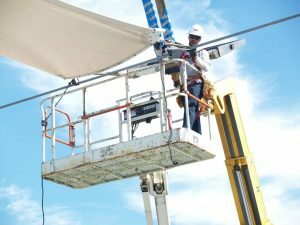 In this post, we’ll explore the final and arguably the most important stage to the overall success of a tensile membrane structure – installation. After our manufacturing team completes the fabrication of the steel members, PTFE or PVC fabric membrane, and/or supporting cables and hardware, our installation team steps in to transform your dream designs into a larger-than-life reality. With a certified installation department, we dedicate long hours of planned methodologies combined with overall project schedules to ensure every detail is considered when performing an installation procedure that’s customized for the needs of each specific project. This minimizes costs for our clients because we streamline each construction stage to use mechanical resources and manpower efficiently. An onsite location will be identified as the designated area for unloading and staging the materials. The necessary size of this area will vary depending on the specifications of the project, but it should be close to the final installation and large enough to accommodate partial assembly (as defined in the installation procedure). The foundation needs of your project depend on the requirements set during the engineering phase. Common foundation options include spread footings, drilled piles, driven piles, grade beams, or drilling into existing decks or concrete slabs. Your project manager will explain the needs for specialized equipment and new concrete pours as the designs are being finalized. As components are moved from the staging area and hoisted into place, your project starts to come to life. Smaller jobs may be able to use hand-cranked Genie lifts, while larger projects require construction fork lifts, hydraulic jacks, and/or cranes. 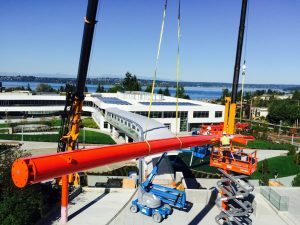 Once the structural framework is in place, installation experts begin working to attach support cables, hardware, and ultimately, the pre-tensioned membrane. Common equipment for this stage may include come-alongs, scissor lifts, boom lifts, articulating “knuckle” booms, or scaffolding. The installation process is often the most exciting part of the design/build process, as months of planning come together to make an iconic piece of tensile membrane construction. Whether it’s a permanent durable PTFE membrane canopy or deployable flexible PVC fabric structure, Tension Structures by Eide Industries will help you discover new solutions to conventional design challenges. For a closer look into our design/build process, click here. Is Tensile Membrane Construction Right for Your Next Project?